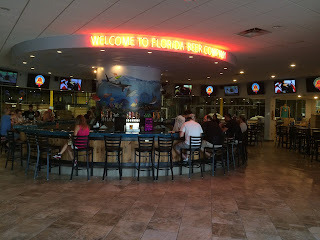 About 30 minutes after leaving Playalinda Brewing Company, my wife and I did a U-Turn in Cape Canaveral. Yep, apparently we missed a tricky turn on the way to Florida Beer Company. If you're going, pay close attention - Imperial Blvd. is right on the other side of one of those causeways. Once you make that turn though, you can't miss the place! I had visited the brewery last year right before they opened their tasting room. 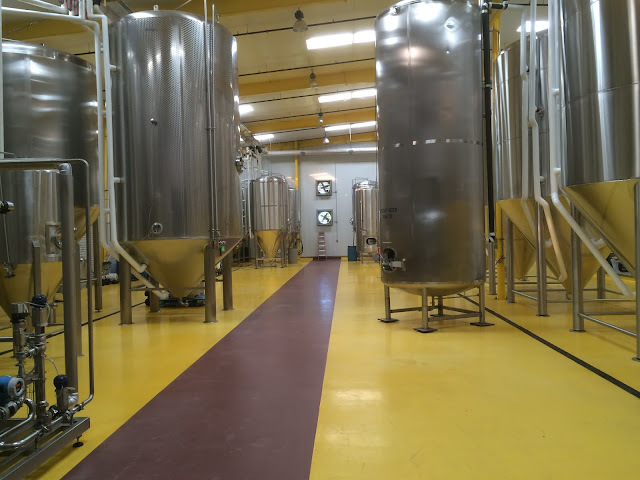 At that time the brewery was already producing beers at full capacity and the tasting room was getting finishing touches. I was able to get behind the glass and see the operation on full tilt. This time, I wanted my wife to get the chance to see a bigger brewery in motion. We arrived at 5:45, just before the final tour of the afternoon. We tasted a few beers before Taylor showed us around the brewery. Apparently, everyone else there already saw the brewery on earlier tours so we had a private one! We got to see the giant tanks, the centrifuge, and the bottling and packaging line. Unfortunately, bottling isn't done on the weekends so we just got a description. I saw it in action before and it's very cool, but I guess it needs babysitting. Back into the tasting room for more refreshment. 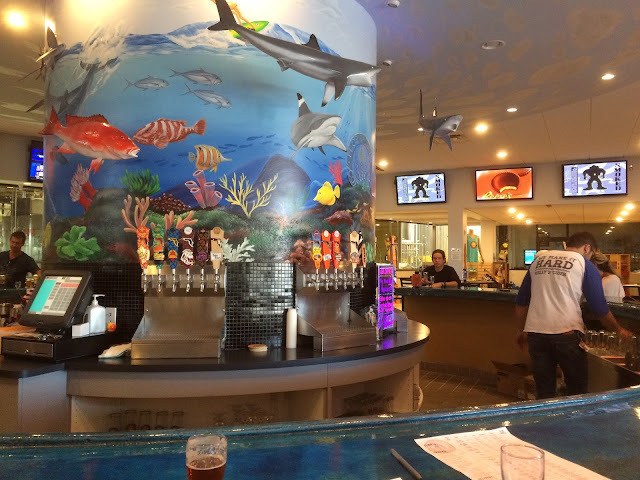 The colorful ocean-themed murals around the center bar and room are really awesome! They have other decorations like custom surf boards, too. Live music was playing until 8 that evening as well. Enjoyable atmosphere. As Taylor poured us a few beers, we asked a few questions. 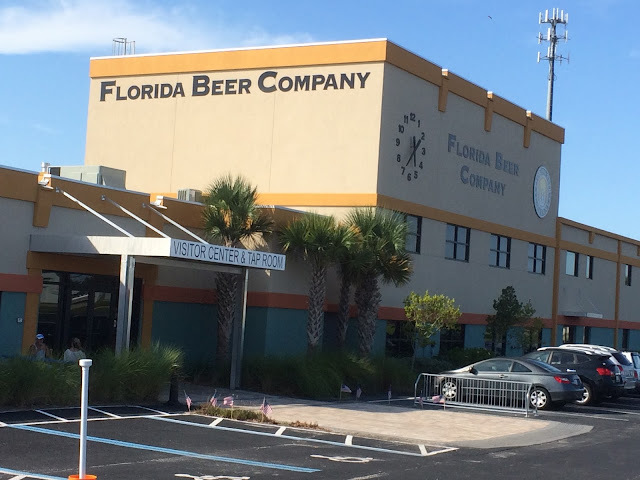 We learned that Florida Beer is only bottling (not canning too) for now. They also do contract brewing for other breweries such as Orlando Brewing. I mentioned that we missed our turn from the main road. Apparently there are strict rules in Cape Canaveral on putting up any signs that might help with that turn. A few tweets later. Taylor thought that owner Jim was spying on him. He didn't realize that I had already communicated with Jim about our visit earlier in the week. Was pretty funny. 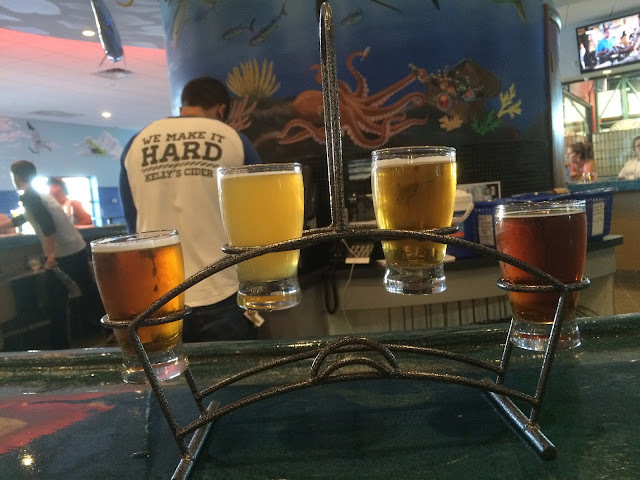 Flight Two: Key West Sunset Ale, Key West Southernmost Wheat, Florida Lager, Florida Red Lager. We also sampled Feast of Flowers Farmhouse Ale and Swamp Ape Red Rye along the way. Since I've tried almost all of the beers before and most are packaged and delivered to my local Total Wine, this trip was about drinking the freshest on tap in a cool environment. Of course I have favorites! I'm partial to the Florida Lager, Key West Southermost Wheat and Sunshine State Pilsner. And who doesn't like a Swamp Ape every now and then. I did get to try the Swamp Ape Red Rye and Florida Red Lager for the first time, but I still prefer the originals. Beers I've tried before but don't see in bottles: Feast of Flowers, very floral, nice bitterness; and Florida's Sweet Oatmeal Stout, very creamy, nice sweetness counters the roasted malt, very good. I must have had a great time - I have like 6 copies of the "flight selection" sheet with notes all over the place! We got a restaurant recommendation on the way out too! If you can't make it to the brewery, check out some local beer festivals and maybe these guys will be there. Anyway, thanks for the visit! We had a fun time and totally enjoyed the beers! 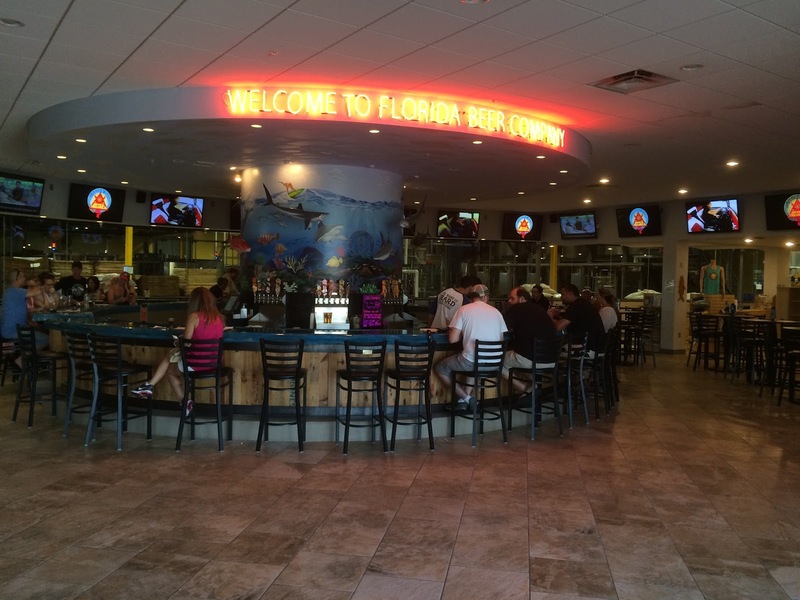 Next up... A brief stop at Cocoa Beach Brewing!